Your home’s siding has two main functions: to protect your home from the elements and to help regulate temperatures indoors. Considering how much surface it covers, your siding also plays a big part in aesthetics. When choosing the color of your siding, Peak Roofing Contractors offers the four questions that will help you pick the best one for your home. Question 1: What does your neighborhood look like? Harmony is a big concept when it comes to color. Many siding contractors in Manassas, VA, will suggest you pick a color close to what’s a common theme in your area. This ensures your home doesn’t stick out like a sore thumb. Of course, if your neighborhood happens to be eclectic in its color palette, explore something different. Question 2: What’s the architectural style of your home? There are different prominent styles in the United States, but you can categorize these as either classic or contemporary. Classic home styles like the Queen Anne favor lighter, simpler colors. The complexity of their design is part of their appeal and light colors accentuate this. Contemporary, modern homes are more boxy and simpler; these are open to a wider range of colors. Question 3: What’s your roof’s color? Your roof and its gutters in Manassas, VA, tend to last longer than your siding. As such, it’s best to match or complement them. If your roof is dark, make sure to match them with lighter colors. Choosing dark colors for siding with a dark roof only makes your home look gloomy. If your roof happens to be of a lighter or neutral hue, then you’re free to experiment. Question 4: Did you check for variances in light? Light—or the lack of it—can make color shift in appearance. What looks great to you in the bright of day might not be as appealing when evening comes. It’s a good idea to place several swatches of your favored colors on different sides of your home. Observe how these look at different times. 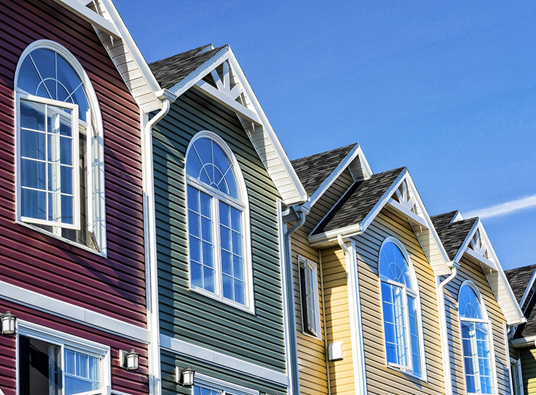 It should guide your decision when shopping for a siding color. Another option is to consult Peak Roofing Contractors. We’ll be more than happy to discuss with you the many color options we have. We’ll even help you choose the one that fits your home perfectly no matter the time of day. Call us today at (703) 745-5153.